Is there such a thing as a “pure” Mack? Yes. You’re looking at it. It’s a Mack Superliner Mark I, 1985 vintage. It will be the jewel in the crown of the Mack pavilion under construction at the National Road Transport Hall of Fame in Alice Springs. 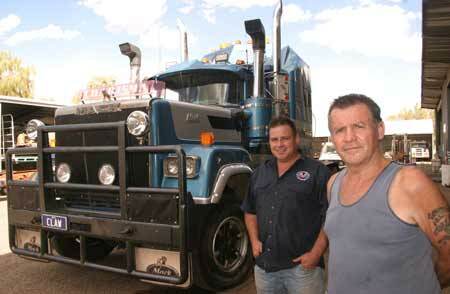 It was driven to Alice Springs from Perth by Dave Matthews (at right in the photo) and his son, James, some 3600 kilometers, burning a litre of diesel every two kilometers. What is so special about this Mack? Everything – namely it was manufactured entirely by Mack (all except the tires). These days Macks are contaminated (not too strong a word for the purists) by input from Renault, Volvo and so on, in line with the vehicle manufacturers having turned into vehicle assemblers drawing their parts from a network of suppliers the world over. This pure-bred 525 horsepower, 18 speed Mack is the marque’s most sought-after collector’s item. After millions of kilometers of travel, towing 120 tonnes on up to three trailers, loaded with everything from oil rigs, mining equipment and livestock, this Mack is still worth its original purchase price of $220,000.